Title: Harry Staser family papers. Volume of collection: 0.2 cubic feet. Language of materials: Collection materials are in English. Collection summary: Family papers of an Alaskan miner and deputy marshal. Harry Staser was born near Evansville, Indiana, in 1891. He traveled to Seattle in 1909 and made several trips to Alaska in 1910, 1911, and 1912. He went to Fairbanks, Alaska, in 1915, and worked on the construction of the Alaska Railroad. After serving in World War I, he studied mining. He returned to Alaska in 1919, the year in which his son, Bruce, was born. 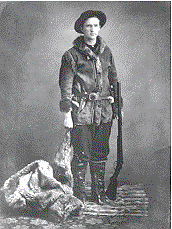 Harry Staser later left the railroad for work in various gold mines. From 1924 to 1932, he served as U.S. Marshal. In the latter year, he purchased a gold mine near Girdwood, Alaska, which he worked until 1940. He died at the mine on February 8, 1940. His wife, Barbara, died in 1953. This collection consists of copies of original records in the possession of the Staser family. Included among the copied papers are the last letter written by Harry Staser in 1939, letters, postcards, and photographs from family albums. The photographs concern the Staser family, especially Harry I. Staser, Bruce Staser, and Betty Jo Thies Staser. They depict Harry Staser’s travels, his family, and early Anchorage and Fairbanks. Arrangement: The original order is undetermined. The collection has been grouped by document type. Digitized copies: This collection has not been digitized. For information about obtaining digital copies, please contact Archives and Special Collections. Rights note: The Archives holds copyright to collection materials created by the Staser family. Preferred citation: Harry Staser family papers, Archives and Special Collections, Consortium Library, University of Alaska Anchorage. HMC-0232: Bruce Staser family papers; 1946-1985. Acquisition note: The collection was copied by the archives with the permission of Bruce Staser of Anchorage, Alaska, in 1980. Additional items were added in 1986. Processing information: This collection was arranged and described prior to 1995. The guide to the collection was updated to meet current standard by Arlene Schmuland in 2018. At that time, materials primarily related to Bruce and Betty Jo (Thies) Staser were moved to the Bruce Staser family papers collection. Location of originals: The location of the original materials is unknown.